Zeus Virus from PutLocker. Watch out Sheffield! Just a quick note to say we had a customer call today who had just been infected with the ‘Zeus’ virus. It seems the likely source was a popular video streaming website called PutLocker – so watch out if you use it. The customer did the best thing and pull the power immediately, and called us. We’re in the process of trying to extract the user data, which hopefully has had the chance to get encrypted. Then we will work on either cleaning the hard drive, or wiping it completely for a fresh Windows installation (best bet to be sure any virus has gone). 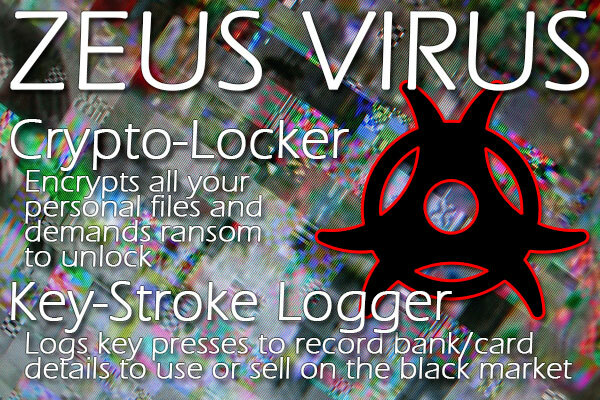 Zeus virus: Includes cryptolocker to encrypt your files for a ransom fee, and a key logger to record keystrokes with the aim of getting personal details to use or sell on the black market. Just got a virus? pull the power immediately, especially if it is a crypto-locker virus (as this will not give the program a change to encrypt everything). Use an antivirus program! Avast is a good from one and Kaspersky has been rated the best paid for one for several years. Backup – always backup you files. You are only as good as your last backup. Backing up to an external USB and the ‘the cloud’ is the best solution. Redmond Cupertino House, 155 Cartmell Road, Woodseats, Sheffield S8 0NL. By using our website and services you agree to our terms and conditions. Thank you.